3 Routes are on offer catering for all level of cyclists. Routes are currently provisional and subject to change. 140K Generous food stop at halfway point and hot food served at the finish ONLY €15. 100K Generous food stop at halfway point and hot food served at the finish ONLY €15. 40K Water & Toilet stop at halfway point with tea and sandwiches served at the finish ONLY €10. We are delighted to announce special rates for anyone wishing to stay over night for our leisure event in April in conjunction with the Abbey Hotel Donegal Town. 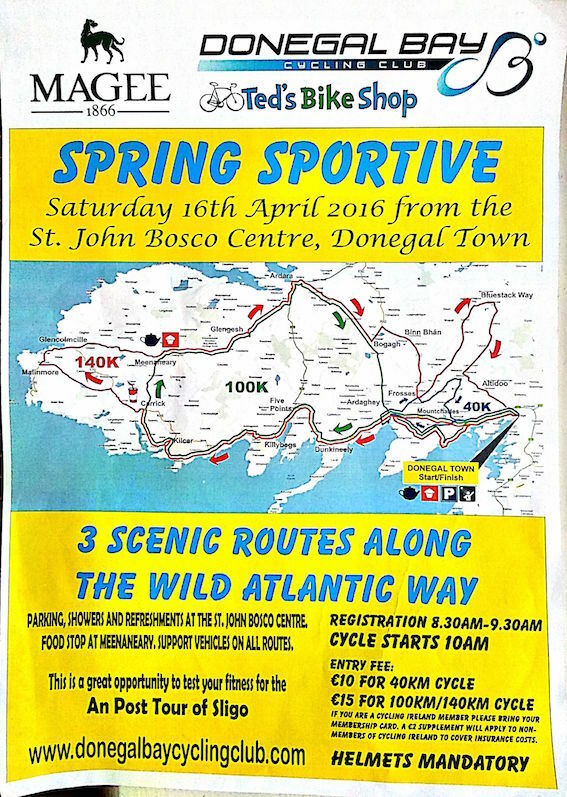 No Replies to "Donegal Bay CC Spring Sportive Sat April 16"